We may not be in Pyeongchang, but that doesn’t mean the Olympics have to stop there. Vacuums have been competing against each other for over a century to earn the title of “best cleaner” around. Today’s competition is all about what a vacuum can do the most for the least amount of money. This is where our rankings of the top 6 vacuums for under $100 come in. These vacuums come from all backgrounds and no two are alike. Among our toughest competitors you’ll find cordless models, canister vacs, and the well-rounded 2-in-1’s. 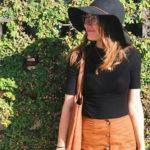 There’s really nothing that an inexpensive vacuum can’t do, which makes this year’s competition for the best budget vacuum fierce. Note: Looking for an option in the next tier up? Here are our rankings of the best vacuums for $200 or less. We’re judging on: suction, quality of attachments, ergonomics, weight, and user friendliness. Though the competition is stiff, you’ll find that none of the vacuums competing this year will disappoint. What to Look for in a Vacuum Under $100? For vacuums under $100, you don’t need to sacrifice quality for price. There are dozens of options that work hard and get the job done just as well as vacuums 2, 3, or even 4 times their price. Upright vacuums will typically have an extendable hose but will not have a detachable head for picking up portable messes. An upright vacuum is what pops into most people’s minds when they think of what a vacuum looks like to them. Canister vacuums are units you pull behind you instead of push in front of you. They’re much more portable than upright cleaners, meaning that it’s easier to vacuum your car and even your stairs with one of these little guys. When buying a vacuum at any price, you’ll want to make sure the quality of what you’re getting is worth more than the price you’re paying. For all of our under $100 picks below, we can assure you that you’ll be getting more for your money. When buying a vacuum for under $40, you’ll most likely be purchasing a stick 2-in-1. Even though these are inexpensive, their suction will still be just as strong as larger upright models. Vacuums up to about $75 will be either upright or canister versions. These will have basic features like hose attachments, but you won’t be getting any extras or premium features at this price point. Vacuums up to $100 will give you premium features that are typically found in vacuums at a much higher price point. 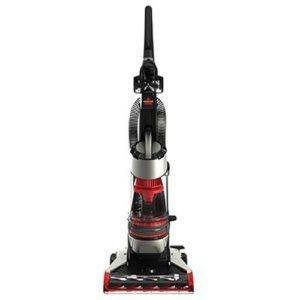 You’ll even be able to find quality cordless vacuums at this price. As you inch closer and closer to $100, the amount you can do with your vacuum will increase. 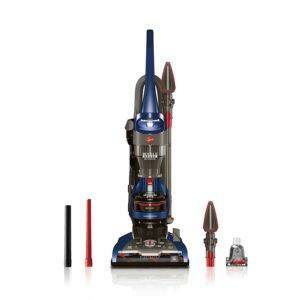 The vacuums that we’ve chosen for our list are the best that you can get. The competition is over, and the medalists have been announced. Did your favorite wow the judges? If the WindTunnel was competing in the budget vacuum Olympics, it would take home the gold. This Hoover has the endurance of a seasoned competitor. No matter how many times you vacuum, the suction will be as strong as the first time as you plugged your WindTunnel in. As far as performance, it always does well no matter what the terrain is like. You can count on your WindTunnel to clean carpet and solid flooring with ease. The WindTunnel elevates the competition to the next level by adding in extra technical points with its retractable cord feature. Not having to wind up the WindTunnel’s extra long cord after an intense cleaning session is a major point bonus. The Hoover WindTunnel is easily our crowd favorite (and for good reason, too). Reviewers find that the WindTunnel is a very solid vacuum and that it’s well worth the price. For what you’re paying, you’re getting many more hose head attachments that even more expensive models don’t have. Some reviewers say that some debris sticks to the wall of the canister when they empty their vacuums out. One user cleans her canisters with canned air to make sure all crevices are dust free and ready for the next cleaning. The swivel of the head may be too sensitive for some users, as a few noted they can’t put pressure on their machines without it twisting out of control. For most, the 90 degree swivel head is an option they love and don’t ever want to live without again. The best feature of the WindTunnel is one that should be included in all vacuums no matter how large or small: a retractable cord. Though seemingly simple, think about the last time you wound up 30 feet of cord around your vacuum; would you want to do that ever again if you didn’t have to? There is a rotating brush at the head of the vacuum, which allows you to transition from hard floor to carpeting with the flip of a switch. Though there is no portable vacuum detachment on the WindTunnel, there is an extendable hose that will allow you to get into places that are hard to reach. Whether it’s under the couch or on top of the fridge, you’ll be able to get to it with the extended cleaning reach feature. There have also been tests conducted with the WindTunnel that show that with regular upkeep between cleanings, there is no loss of suction whatsoever. Endurance is no problem for this Hoover. This is not a lightweight vac at all, clocking in at over 16 pounds. For people who are looking for something easy to push around, you’ll want to find a featherweight or canister vacuum instead. The rotating brush head feature is all fun and games, until you forget to turn the brush head off and scratch your floors. You’ll want to make sure that you pay close attention to what you’re doing when vacuuming to avoid making a huge mistake and floor repairs. One feature that isn’t necessarily a con but is annoying is the location of the on/off switch. It’s near the middle of the back of the handle, which is just a bit awkward to reach. This is one of the most expensive vacuums on our list, but it has some premium vacuum features at a budget vacuum price. 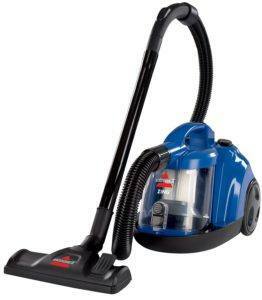 When finding a vacuum this inexpensive, you should expect it to work well and do its job. You may not expect it to have a retractable cord and have users praise it for how well its pet attachment works. The older version of the WindTunnel doesn’t have a pet attachment tool. This improvement ensures that you pick up much more pet hair with the WindTunnel 2. The previous WindTunnel also doesn’t have an extended cleaning reach arm, which means you’re not able to clean areas that aren’t right next to the body of the vacuum. This seriously limits the use of the older WindTunnel. The silver of our budget vacuum Olympics goes to none other than to the VonHaus Lightweight. The versatility of this competitor is what really sets it apart. With the VonHaus, you’re getting both a portable vacuum and a stick vacuum all in the same package. The VonHaus also cleans on a platform of being eco-friendly, which means that HEPA filtration and reusable filters are all a part of the package. Not only is the VonHaus versatile, it’s light as a feather. If you’re lucky enough to be the VonHaus’ cleaning partner, you’re in for an effortless cleaning session. As far as budget picks go, the VonHaus scored perfect tens across the board. Despite the VonHaus stating that their vacuum is optimized for hard floors, some users still thought that their VonHaus would be the VonHaus to work on carpeting. Those users were disappointed in the results. One reviewer noted that she loved to use good smelling carpet powder on her floors before buying the VonHaus. When she used the powder on her carpet, the vacuum couldn’t handle both the plush flooring and the powder because it’s just not made for that; this resulted in one disappointed user. Reviewers that used their vacuums for floors like hardwood, tile, and laminate were thrilled with the way that their VonHaus cleaned. As long as they stayed away from plush carpeting, users were happy with the results. When you buy a 2-in-1, you’re saving yourself from the headache of looking for a separate portable vacuum, which is always a plus. The VonHaus doesn’t have an extendable reach attachment, but it can get into crevices and clean stairs like a pro. The large 1.3 L dust container is the perfect size for only needing to empty your vacuum once per cleaning session. Though it’s large, it doesn’t make the ultra lightweight VonHaus any heavier. For those with allergies, HEPA filtration is there to make sure the dust you pick up doesn’t get thrown back into the air. Especially if you have pets, HEPA filtration is incredibly useful to keep hair in the vacuum where it belongs. The VonHaus is optimized for hard floors and hard floors only. If you use this vacuum on even the lowest pile of carpeting, chances are, it won’t work at all. The cord of the vacuum wouldn’t be a problem if the cord didn’t get in the way of cleaning. Many users find it difficult to not step on the cord and would like there to be some sort of mechanism to lift the cord away from their feet to avoid accidents. There are attachments to use on your VonHaus when it’s in portable mode, but the attachments aren’t very useful. Many say that the attachments barely fit on the end of their vacuum, making it hard to use them. This is one of the least expensive 2-in-1s you’ll be able to find. The value for what you’re getting with the VonHaus is incredible. 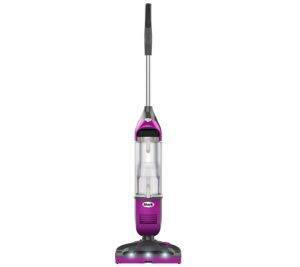 If you were to buy a budget upright and portable vacuum separately, chances are, there would be no way you could find a better deal than what you see here. This seems to be the only edition of this VonHaus, so it hasn’t been improved on as of yet. For future models, most users agree that they would like to see something to hold the cord off of the ground and would like better fitting attachments for the portable vacuum head. Last but not least, our bronze medal for vacuums that don’t break the bank goes to the Bissell Zing. As the underdog of the group, the Bissell Zing cleans incredibly well on both hard floors and carpets. If you have pesky stairs to clean, the Zing will climb them with ease like the champion it is. The Zing shocked viewers everywhere when it revealed it had not one, not two, but 3 filters. That kind of dedication to containing allergens is not seen in many other vacuums. The retractable cord trick by the Zing was an unexpected but fantastic ending to a cleaning routine that truly sucked. Compared to all other canister vacuums, there was no one the fans were rooting for more than the Zing. Reviewers say that they’re happy with how powerful the suction of the Zing is. Though it’s not as mighty as a shop vac, it’s much quieter and gets the job done well. The reusable filters will make any eco-friendly reviewer happy. The only downside to this is that they all need to be taken out and cleaned every so often to keep the strong suction of the Zing. You’ll inevitably need to answer the door or tend to a crying child while cleaning, so why should you have to lay your entire vacuum down on the floor if you’ll be right back? The Zing is able to keep your hose standing upright until you’re ready to clean again, which users love. Cleaning both hard floors and carpeting is essential for a modern home, and the Zing has you covered. There’s even a lever to lower small bristles on the head of the vac for when you’re vacuuming carpet with your Zing. Retractable cords are all the rage right now, which means Bissell wouldn’t miss an opportunity to give its users the latest and greatest in vacuum tech. Your Zing has an easy to use retractable cord. Cleaning stairs is made easy with a canister vacuum. There is a handle on top of the small body of the Zing, which makes it simple to pick up and place on the stairs below you while you vacuum your way to the top. The Zing also has a 3 stage filtration system which ensures that you won’t have any dust particles flying back into the air while cleaning. Each filter captures more and more dust, so once you use the Zing, you’ll never want to go back to a vacuum with a single barrier. Canister vacuums are difficult to work if you’ve never tried one. When you use an upright, you need to push the vacuum to clean; when you use a canister, you need to pull the vacuum behind you. Once you get over the learning curve that comes with buying a new vacuum type, you’ll be good to go. Some users noted that though the product itself doesn’t act like a cheap product, the plastic used makes the Zing look much cheaper than it is. This con is all about aesthetics, which may matter to some more than others. Though you can clean carpets with the Zing, sticking to hard floors if you can would be your best bet. For area rugs, the Zing works wonderfully… for vacuuming 3000 square feet of shag, not so much. 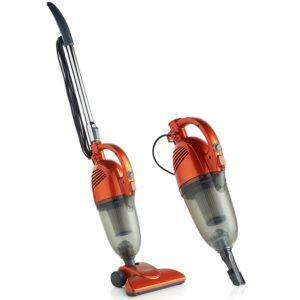 Compared to other canister vacuums in its price range, you’ll see few that are bagless, like the Zing. Other canister vacuums will require you to purchase bag after bag to clean, which makes your vacuuming expensive over time. With the Zing, you just empty your canister, wipe it out, and get ready for the next set of messes (all free of charge). There is another version of the Bissell Zing that is bagged rather than bagless. With a bagged vacuum, you’re going to be spending money on bags every few months or so. If you’d rather not have that cost to upkeep your vac, going with the newer bagless version of the Zing is the way to go. Is there anything easier to use than a vacuum with a retractable cord and a triple action deep cleaning brush roll? The Bissell CleanView says that there’s not. With the CleanView, you’ll be getting a budget vacuum that cleans carpeting as well as a vacuum 2 or 3 times its price. Now, that’s the kind of cleaning product we like. The suction on the CleanView leaves users with that “I just vacuumed look” that everyone loves, which shows you and your guests that it’s working and that it’s working well. Even though the CleanView has great suction, it’s a burden to use on stairs and won’t fit under any of your furniture. If you’re looking for something sleek, this is not the vacuum for you. The triple action brush roll on the front of the vacuum is great at picking up hairs and dust from deep within your carpeting. You won’t need to make more than 2 passes to get everything off of your floors. The retractable cord is, as always, something that users love and actively seek out when they’re buying a vacuum of their own. Ease of use is number one for the CleanView. The turbobrush tool is what you’ll want to use to get hair and dirt off of your upholstery. Pet hair stands no chance against this easy to use attachment. Though the triple action brush roll gets a lot of dirt off of the ground, it can’t be turned off entirely. It can be slowed down for use on hard floors, but if you’re not a fan or are afraid that the rotating brush may scratch your hardwood, you’ll want to pass on the CleanView. Some users said that after an extended period of cleaning, their vacuums actually overheated and started to burn from the inside out. This is not a common occurrence, but I’d stay on the safe side and take mini breaks throughout cleaning just in case. For something so inexpensive, you might be wondering if it even works at all. According to thousands of happy customers, the Dirt Devil Simpli-Stik smashes all expectations. With the Simpli-Stik, you’re getting a handheld and stick vacuum that can work on both carpet and hard floors. For a simple straight to the point cleaning experience, the Simpli-Stik has your back. Reviewers say that you have to empty the dirt cup often while cleaning so that the machine doesn’t clog. One user said that she emptied her dust cup after every large room which, though may be overkill, worked well for her. One reviewer said that she doesn’t fancy the floor attachment, but her Simpli-Stik wis now her go to handheld. She ditched the long stick altogether and uses her vacuum solely as a dustbuster. This vacuum might be small, but it’s extremely versatile. You have a full sized stick vacuum and a handheld all in one with the Simpli-Stik. There is a crevice tool that you can attach to the Simpli-Stik in dustbuster form, which is the product you’ll need to round out your Dirt Devil cleaning routine. One other pro of the Simpli-Stik is the fact that it weighs hardly anything. You won’t feel like you’re working at all when gliding this small vacuum across your floors. The way that the floor head attachment is made may be a bit misleading. There is a single hole in the center of the floor attachment, which all of the dirt is sucked in through. Some reviewers said that the suction on the ends of the floor head attachment wasn’t the best. For maximum results, they needed to place the center of the vacuum head directly over what they were cleaning. The vacuum may not weigh much, but that could also be because of how small and short it is. If you’re tall, you’ll probably need to bend over to use the Simpli-Stik. A solid cordless vacuum for under $100? Sign us up. The Shark Navigator is a cordless vacuum that has a great battery life, can clean hard floors and carpeting, and that automatically stops charging once the battery is full. With built-in LED lights to lead the way, navigating through your home has never been easier. Cordless vacuums are usually much more expensive than this one, which means they love that they’re getting a deal on a premium feature. Not having a cord while simultaneously not breaking the bank is a major plus. Pet parents say they love that the Navigator was built to be a pet hair vacuum, as if it’s no problem. Many were shocked at exactly how much pet hair came off of their floors after using the Rotator once. This Shark vacuum has a precision charging dock, which means that once the battery is full, the charger will turn off. This saves the life of your battery in the long run. Carpets and hard floors are easily cleaned with the Navigator. The 2 speed brush roll feature lets you quickly switch between flooring type modes. The head of the vacuum may be difficult to swivel at times. This means that getting into small corners and around the legs of chairs is a bit of a hassle. Though the Navigator is quite light, the vacuum is not low profile at all. You’ll have difficulty getting under coffee tables and won’t be able to get deep under couches with its bulky design.